Many people bemoan the fact that they can’t grow their own food (or even flowers) because they lack any kind of garden space, but guess what? You can actually grow more than you realize in really small areas as long as they get a bit of direct sun. Hell, you can even grow things indoors under a lamp, but there’s something special about plucking your own food from a stalk that’s been sitting in summer sunshine all day. 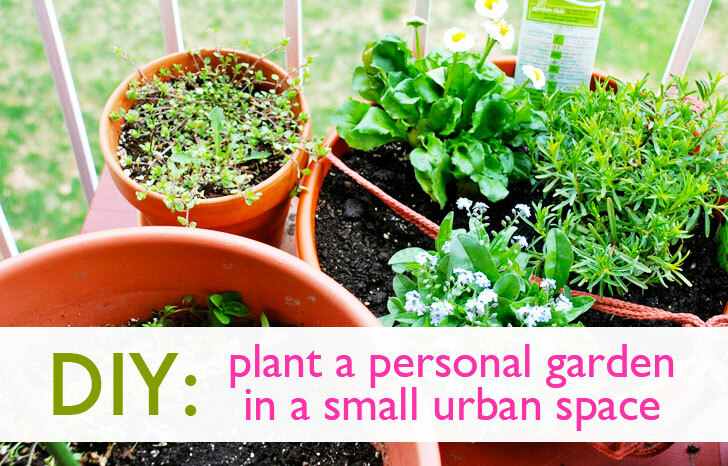 In any case, whether you have a little concrete slab behind your house, a fire escape outside your window, or even a tiny balcony, your urban garden can be a veritable Eden of fresh, healthy, home-grown vegetables, and herbs. 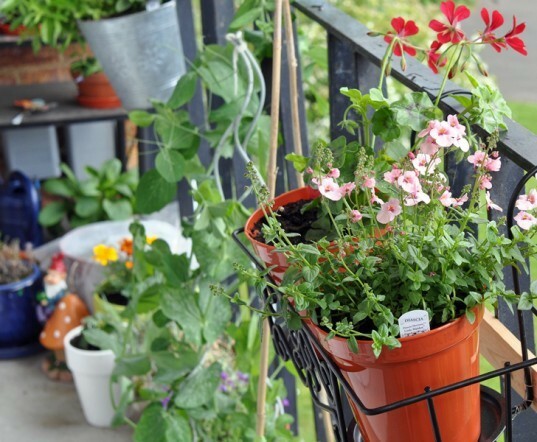 There are a variety of “one-pot” container gardens you can create that can be placed on a small balcony or patio to provide you with everything you need for basic dishes, all summer long. All you need is a galvanized steel tub that has had holes drilled in the bottom for drainage, some soil, plant seedlings, water, and sunshine. Strawberry pots are also ideal for this, as they have openings staggered around their sides for various plants to peek out from. Tomato and Spice Planter: Tomatoes, jalapenos, basil, chives, and cilantro will provide you with what you need for salsas, sauces, and Bloody Mary drinks. Salad Planter: Grow an assortment of lettuces, chives (the flowers taste fabulous), edible blooms like violets and nasturtiums, sorrel, parsley, and tarragon for your salad and dressing ingredients all in one place. Culinary Herbs: Basil, parsley, cilantro, chives, summer savory and other leafy green herbs all grow well together, but it’s best to grow dill and mint on their own. Woodsy herbs like rosemary and thyme can share spaces quite happily, and all of these can be grown either in outdoor planters, or on a sunny indoor windowsill. Tisane Planter: Do you like herbal teas? Consider a selection of small pots around your space in which you grow peppermint, lemon balm, bergamot, chamomile, thyme, and lemon verbena. You can pluck these throughout the summer and then dry whatever’s left once autumn rolls around. Baskets: A hanging lettuce planter isn’t just the perfect way to have a constantly self-replenishing source of salad just outside your window—it’s also really gorgeous. A wire cage is filled with sphagnum moss, and then seedlings are woven through the bars to be held in place. Just water regularly, snip off what you need, and it’ll keep re-growing until late Autumn. Soda Bottle Planters: Remember those upside-down pop-bottle planters we mentioned a while ago? Those can come in remarkably handy for vertical gardening. Tomatoes, peppers, cucumbers, eggplants, squashes, kale, lettuces, and countless herbs can thrive while swinging upside-down. Re-purpose those soda containers to grow edibles that are far healthier than what they originally contained. You’d be amazed by just how much food can be grown by focusing your attention upward. 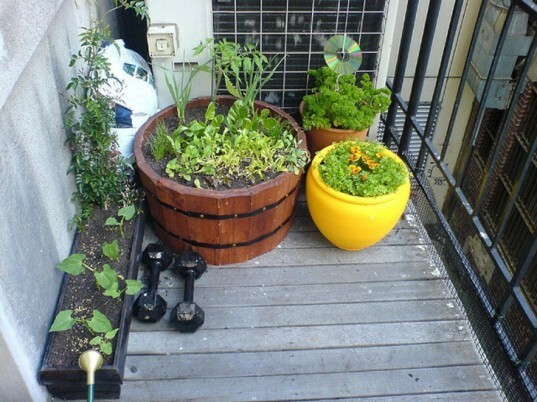 Old wooden palettes can be secured against sunny walls and used to grow all manner of salad greens, herbs, and flowers. As far as trellises go, you can either pick up a cheap one at a garden center, or MacGuyver your own using bamboo poles and zip ties, old ladders, broken futon frames/stripped box springs, and even lengths of twine. Food plants such as pole beans, climbing peas, and cherry tomatoes do amazingly well on trellises, as do flowers such as nasturtiums (many varieties are edible!) morning glory, and countless other climbers. 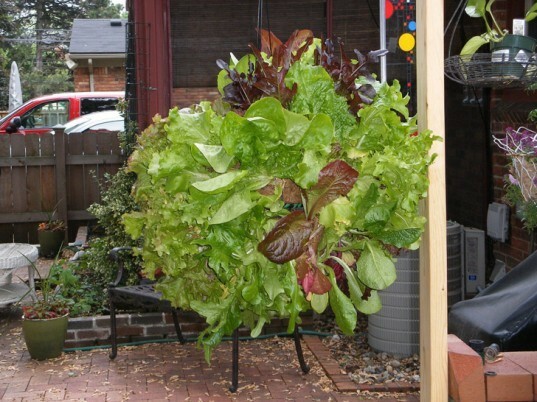 By now, you’ve probably come across pictures of the “gutter gardens” that are springing up all over the place; someone decided to attach some gutters to the side of their house to grow greens in, and that idea has gone viral. If the gutters are placed a few feet off the ground, you don’t have to worry about neighbourhood squirrels, rabbits, or other small animals chowing down on your lettuces and herbs, nor is there much worry of crawling insect damage. 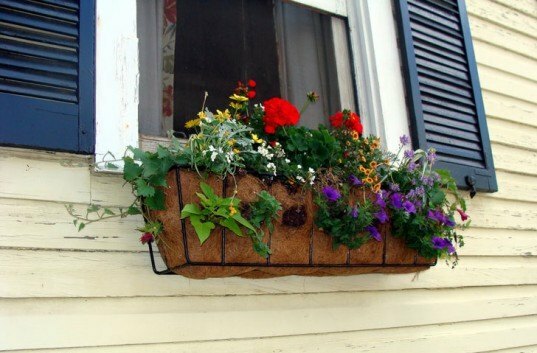 Window-boxes can be slung on balconies and patio railings, or even from your windowsill (hence their name). These are great for growing edibles at arm’s reach, and for adding a bit of beauty to your view; every time you look out your window, you’ll see greenery, even if you live in the middle of a congested downtown core. If you have little interest in growing your own food but would love to have splashes of fragrance and color around, then you can also use window-boxes for flowers. Impatiens, begonias, pansies, and countless other varieties can brighten up your space exponentially, inside or outdoors. It’s always important to research the plants you plan to grow, as not all are compatible as far as being grown in close quarters. For example, pole beans go well with marigolds, but don’t play nicely with anything in the onion or garlic family, while tomatoes are good friends with basil and parsley, but shouldn’t be planted near fennel or kohlrabi. Consult a companion-planting chart while you’re in the process of designing your garden space so you don’t accidentally plant bad neighbors together and end up with a mess on your hands. There are some spectacular books available that can help you to plan the best small garden for your home, with solid plans that can help you maximize any space imaginable. One Magic Square by Lolo Houbain has plans and recommendations for 30 different garden schemes, ranging from “cut and come again” organic salad plots to anti-cancer herb and veg beds. Grow Great Grub by Gayla Trail encourages you to take advantage of any space around you, from window boxes to rooftops, to grow more organic food than you ever thought possible. Fresh Food from Small Spaces by R.J. Ruppenthal shares some pretty spectacular knowledge about growing food in unorthodox ways. If your place has a windowsill or countertop that gets a fair bit of light, you can grow stuff there. You’ll be amazed at the amount of food you can grow in the tiniest space, and how different organic food tastes in comparison to the stuff you can find at the grocery store. Though you might live in a tiny, one-room flat in the very core of your city, you still can enjoy fresh greens that you’ve grown yourself, and experience the joy that comes from gardening—even if it’s just on a window ledge. Note: if you live in a rented apartment or condo, it’s best to get your landlord’s permission before growing anything. It might also be a good idea to do some research regarding your rights as a tenant, and whether there are any clauses specifically focused on growing food on your rented property. Hi Donni, Right now I have a trellis full of green beans crawling up an interior wall, and big pots of lettuce and arugula as well, so yes, you can absolutely grow them indoors! You just need an interior space that gets a lot of sunshine over the course of the day, and make sure to water everything regularly. I love your lettuce ball and I'm wondering how you began. Would something like this be ok to grow indoors?? Many people bemoan the fact that they can't grow their own food (or even flowers) because they lack any kind of garden space, but guess what? You can actually grow more than you realize in really small areas as long as they get a bit of direct sun. Hell, you can even grow things indoors under a lamp, but there's something special about plucking your own food from a stalk that's been sitting in summer sunshine all day. 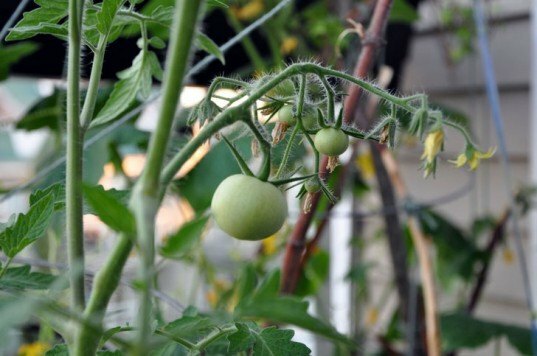 In any case, whether you have a little concrete slab behind your house, a fire escape outside your window, or even a tiny balcony, your urban garden can be a veritable Eden of fresh, healthy, home-grown vegetables, and herbs.